Active participation by communities is the key to the long-term sustainable conservation of an area. The Burrenbeo Conservation Volunteers is an active voluntary community that works towards the sustainable management of the Burren by addressing key conservation issues and needs in the region. They were set up in 2010 by the Burrenbeo Trust to answer a need of active conservation in the Burren region so that people in the area could do something for the area. In a region of decreasing rural population key conservation issues such as scrub encroachment and the rebuilding of stone walls are becoming harder to tackle. The Burrenbeo Conservation Volunteers (BCVs) was born out of a need for hands-on conservation workers. Furthermore, researchers have identified an increasing need for scrub clearance to enable a continuation of archaeological and ecological surveying – gaining sufficient knowledge of what actually exists also aids experts. BCVs often undertake surveying work aiding a greater understanding of the area – Volunteers are the new ‘eyes on the ground’. 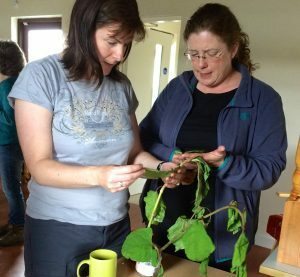 By training groups of volunteers Burrenbeo Trust is actively supporting a sustainable future for the Burren. We all know that working in teams can get the job done much faster – well, this is definitely the case when it comes to scrub clearing, stone wall building, archaeological digs, invasive species mapping, clean coast initiatives… the list goes on. Working as a collective, building a bank of active volunteers and collaborating with other local organisations who share the same vision, has proven to be half the battle when making positive efforts towards conservation locally in the Burren by creating an inclusive environment for people to come together, share their passion for conservation and be part of a growing, energetic and welcoming community. When it comes to conserving this beautiful Burren landscape, we all have a part to play – we just need to identify it. The power of local communities is a transferable skill which can be experienced the world over and each and every one has something to give. Who can join the volunteers? Everyone is welcome to get involved – the more the better, so come join us – its free, just your time is needed! Events are most suitable for over 18’s, under 18’s must be accompanied by a responsible adult. To register with the Burrenbeo Conservation Volunteers email volunteer@burrenbeo.com. Invaluable skills are developed through training courses and workshops which are there to encourage learning, build confidence and ensure safety at all times. The group is open, welcoming and tirelessly attempts to engage with wider communities and enlist a broad spectrum of experts – driving home the importance of conservation. Each conservation action day is led by an expert. These professional leaders are in the position to up-skill and impart knowledge to volunteers on a specific subject. With some leaders, the BCVs carry out on-going conservation work to support sustainable impact where needed. Other action days may be a one-off situation that needs addressing. The leaders have the experience and enthusiasm to lead the group through the task. We are hugely grateful to all our leaders. So, are you interested to be part of maintaining the Burren’s history, culture and precious ecosystems? If so, why not join the fun and enthusiastic team of conservation volunteers, share your passion for the Burren with others and make a huge difference to the biodiversity and maintenance of this unique landscape. Becoming a volunteer offers you an opportunity to build skills, knowledge about place and indeed, lasting friendships. This is an active group of conservation volunteers that have been working in areas of archaeology conservation, rare species monitoring, managing scrub encroachment and much more since 2010. The BCV hold monthly events. Find the links below to the ones that interest you. Please note that all our event leaders and experts are volunteers (many of whom have full time employment elsewhere) and often give much of their precious free time to helping run volunteer events. For this reason it is difficult to run one off events for groups visiting the Burren. The Burrenbeo Trust can occasionally organise such events but they are at a cost to cover the time of the leaders and experts on the day. Email info@burrenbeo.com for more details. The Burrenbeo Conservation Volunteers comes under the umbrella of the Burrenbeo Trust for insurance and administration but has its own committee of community members that guide and support the group. Kate Lavender who works in the Burrenbeo Trust is the Volunteer Coordinator. Burrenbeo Conservation Volunteers relies on members of the community to lead the volunteer days. Current leaders include Mary Howard, Ritchie Jones, Kate Lavender, Clodagh and Michael Lynch, Anne Mullen, Eileen O’Connor, Sharon Parr, Wendy Smith and Mike Scanlon. We are grateful to all our leaders past and present for the immense time and energy they give to coordinating events on a voluntary level. All our leaders are first aid training. Many of the volunteer events are about further educations the volunteers around a certain area of conservation. We are hugely grateful too all the experts past and present that have support this up-skilling and training. Below are who we have worked with regularly in the past 12 month or so. Dr Michelle Comber is an archaeologist based out of NUI Galway. She is highly involved in running the Caherconnell Fort archaeology summer school. Michelle has done artefact training and pre-dig survey work with the volunteers. the Burren, the volunteers have been working closely with the National Monument Officer for the region, in clearing scrub, doing preliminary excavations and helping out with survey work. The main bulk of work that the volunteers have done with Christine is at Kilcroney, nr Carron. Jesmond Harding is a founding member of Butterfly Conservation Ireland. A huge butterfly enthusiast and author of ‘Discovering Irish Butterflies and their Habitats’ has been working with the volunteers since 2010 on managing a site call Fahee North near Carran which is the host of many species of butterflies including the rare Marsh Fritillary. By managing the encroaching Hazel scrub the volunteers are helping this rare butterfly increase its breeding potential. monuments in the Burren including many previously unrecorded sites. 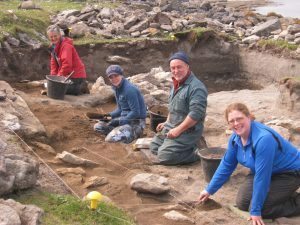 Their main interest is in prehistoric archaeology and their recent excavations at Fanore More and Doolin are part of their research. Much of this work has been carried out with the assistance of the Burren Conservation Volunteers Michael is the Field Monument Advisor for Co. Clare. 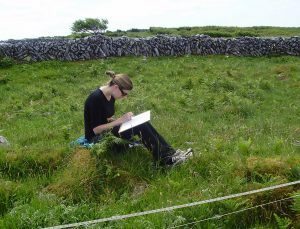 Dr Sharon Parr is the Scientific Officer with the Burren Programme which follows on from the award-winning EU project – The Burren farming for conservation project, BurrenLife. She is the BSBI vice-county recorder for Co.Clare. Sharon works with the volunteers on numerous ecological related projects. Her main site is the clearing of encroaching species at Cappagh Tower house nr Carron. Dr Ros Ó Maoldúin is an archaeologist based out of NUI Galway. He has a particular interest in the Bronze Age era of Ireland. He is the field director of the Irish Fieldschool of Prehistoric Archaeology. Ros has work with our volunteers in pre-evacuation surveys around Roughan hill near to Corofin. Dr Kate McAney and Ruth Hanniffy work for the Vincent Wildlife Trust. They promote mammal conservation and research through lectures, bat walks and publications. They have been working with the volunteers in helping restore an important bat roosting site near to Ruan. Paula McHale is part of the team at the Burren Life farming for conservation programme. She is also the regional coordinator of butterfly transects for the National Biodiversity Data Centre. Paula has been key in training the volunteers in butterfly transects and in invasive species. Rory O’Shaughnessey works closely with the volunteers on dry stone walling and the importance of these walls in natural, built and cultural heritage of the Burren. Rory is a heritage specialist in schools and descends from one of the oldest clans in the Burren Lowlands. A graduate of NUIG and UCC he divides the year as a tour guide, stonemason and an educator and has been involved in devising, delivering and tutoring on numerous and diverse courses in the heritage field from stone walling to genealogy to archaeology. Rory has been working with the volunteers on walling out on Blackhead, between Ballyvaughan and Fanore. What have the volunteers achieved?